With her small, strong hands, Wilma Tosa worked the dark gray clay across an old canvas cloth, folding in cups of water until the soft, kneaded material made a clean break in her hand. As she started to coil the snake around a clay base, students from the “Fundamentals of Archaeological Methods and Reasoning” course taught by Matt Liebmann, John and Ruth Hazel Associate Professor of the Social Sciences, and Rowan K. Flad, John E. Hudson Professor of Archaeology, watched mesmerized before trying to replicate Tosa’s handiwork. 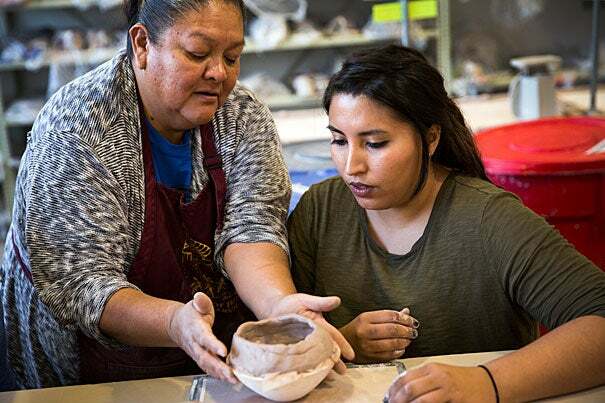 Liebmann, who has worked with Tosa and her husband, Aaron, for nearly two decades, brought the couple to Harvard from their home at Jemez Pueblo in New Mexico to show students artistry that dates back at least 700, probably thousands, of years. Tosa learned her family’s pottery traditions as a child, first making tiny pots with the head of a turkey or ashtrays in the shape of the outdoor oven (or horno) when she was 5. She watched her grandmother make pots for cooking and she spent years honing her skills in hand-coiling and sgraffito (etching), created with the broken end of a sewing needle on fine wedding vases. “We have two kinds of clay that we get from the land. The light clay needs more work, but the darker one found in the mountains on the south side of the pueblo is mixed with volcanic ash. It is much easier to work with,” said Tosa, whose tribe numbers 3,000. 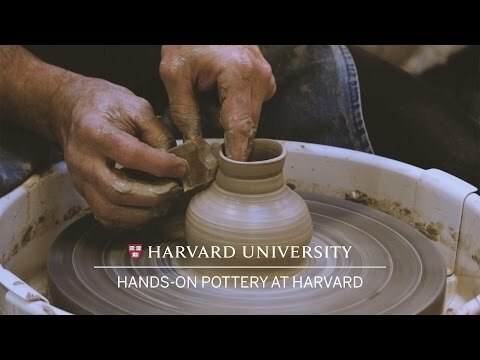 Her lesson for students was part of the larger, hands-on instruction that embraced experimentation and the study of historical and cultural context in clays and pottery-making techniques. At one station in the ceramics studio, Steve Murphy led a mini lesson in wheel throwing, while teaching fellow Wade Campbell led another group of students through an analysis of shards of earthenware. Director of Education for the Ceramics Program Kathy King led another lesson, explaining the science (the temperament of various materials such as gravel, seashell, charcoal) behind the materials, and giving a basic chemistry lesson about clay bodies. She was as enthusiastic about the Tosas’ visit as the students were. 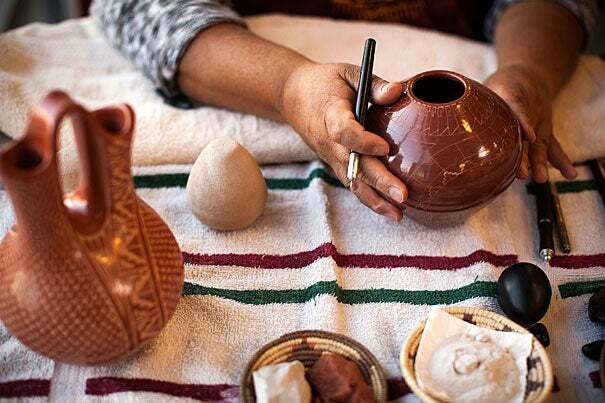 Rodrigo Cordova ’19, a Cabot House resident who is studying astrophysics and physics, said the intensive pottery instruction, especially the session with the Tosas, brought the past into the present. “Seeing how different people interact with the earth and civilizations reaffirms how we go to where we are. It’s thought-provoking to see the beginning of an art form right in front of us,” he said.